Elisabetta Marino: When did you begin to write? Did your background as an Italian American have a strong influence on you? Marino: What about the city of Chicago, where you grew up. Did it have and does it still have an important role in your writings? Ardizzone: Being born and coming of age in Chicago had a great and lasting influence on my writing. I was born in Columbus Hospital, a Catholic hospital founded by Mother Cabrini, who is now recognized as a saint. She founded the hospital to care for the city's poor Italian immigrants and their families, who were turned away from other hospitals. Chicago is present in each of my books. When I read James Joyce's Dubliners, I realised that his stories were set on Dublin's actual streets, so I collected maps of Chicago and still use them when writing a story about the city. Chicago's ethos certainly shaped me—as Carl Sandburg called it 'the city of big shoulders, hog butcher of the world'—and I've done my best to reflect its people and character in my writing. I'm proud to be from Chicago, even though I no longer live there. But my mother still lives in the same North Side brick two-flat that my parents bought back when I was nine years old. Marino: What about your background as a Catholic? What importance do you attach to it? Ardizzone: I'm more a cultural Roman Catholic than a practising one. Still, I often carry a rosary in my pocket, particularly when I'm travelling, and I continue to this day to have many habits that I learned in school, such as making the sign of the Cross whenever I hear a passing ambulance. I respect Catholicism even though I don't agree with many of its teachings. I attended Roman Catholic schools for thirteen years. When I was young I was an altar boy, and up until the time that I began noticing girls I wanted to become a priest. Since the idea of travel appealed to me, I thought about becoming a missionary priest. As a writer, I feel fortunate to have been given such a rich cultural and religious tradition to work with. I often write about Catholicism and have just completed a book involving the art and histories of several of Rome's most famous churches. The church's stories reflect on the lives of the contemporary characters in my book. Marino: The idea of travelling, of changing perspective, of facing difference is present in your outstanding collection entitled Larabi's Ox: Stories of Morocco. What prompted you to write it? How does it connect with the genre of travel literature? Ardizzone: I taught for several years at Old Dominion University in Norfolk, Virginia, and during the late 1980s helped write a government proposal for a student/faculty exchange between Old Dominion and Mohammed V University in Rabat, Morocco. After the proposal was accepted, I was sent to Morocco to teach during the fall of 1985. I never intended to write a book about Morocco, though I kept a journal while I was there. After I returned to the U.S. I wrote the story "The Beggars", prompted by a racist comment about Moroccans made to me on the airplane flight to Casablanca. I then wrote a story about another character, one who realises he has terminal cancer. In each of these stories there was a grain of what I'd experienced, expanded upon by my imagination. I then wrote the title story, "Larabi’s Ox", about a bus striking and killing an ox on the road from Casablanca to Rabat, and in a sudden moment of creativity had the impulse to place the two characters from the earlier stories inside the bus, as passengers. It was then that I imagined I had an interconnected book. I added a third character to the bus, a young red-haired female travelling alone, sitting in the back of the bus, smoking. She became one of the book's major characters. I also added an older woman—I believe a woman from England—who never made it into the collection, at least not literally. I did feel the need for an older female character and used that impulse to create one of the book's minor characters, an expatriate living in Fez, who appears in a couple of the stories and befriends the other female character. In all of these stories are grains of actual experience, seeds culled from my notebooks and my memories of my visits there. But none of the stories is autobiographical. My actual time in Morocco—and here I'm talking about my first trip there in 1985—was rather dismal, certainly not material fit for a book anyone would care to read. After I realised that I was writing an interconnected book I felt I needed to see more of the country, particularly the south, and so I returned to Morocco during the summer of 1988 for more research. 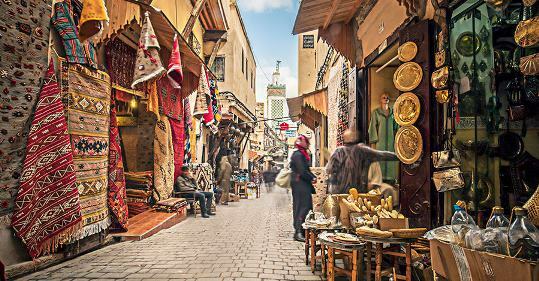 During my visit in 1985 I spend most of my time in Rabat, Casablanca, and Fez. In 1988 I spent a good amount of time in Marrakesh and then east, in Ouarzazate, and on to Zagora and the desert. I don't see the book as 'travel literature', though I certainly don't mind the label. Larabi's Ox is a book about character and experience as well as place. I think the book does what good travel literature accomplishes, offering the reader a strong and vivid sense of place. Marino: Among your literary endeavours, In the Garden of Papa Santuzzu certainly holds a pivotal position. Can you please expand on that? How much of it is life, how much of it is fiction? Ardizzone: My travels in Morocco gave me a new, deeper understanding of my Italian-American heritage. My father's parents were born in Sicily, in what was then called Girgenti (now Agrigento), the African side of the island. I had several experiences in Morocco when Moroccans would tell me that they were about to feed me something particularly Moroccan, and it would be something I was familiar with, something my grandmother and aunts made. Many Moroccan beliefs were beliefs I understood and had heard about from my father's side of the family. At the same time I was teaching ethnic American literature, and I realised that there was no novel that told the story of the southern Italian movement to the Americas. 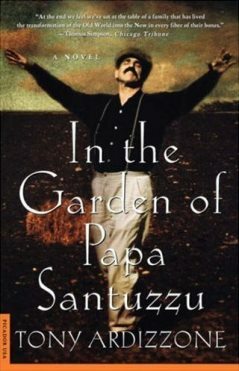 This sense of familiarity coupled with the absence of such a book gave me the courage to write In the Garden of Papa Santuzzu. Papa Santuzzu took me seven years to write. I put enlarged photographs of my great- grandmother, who remained in Sicily, and my grandfather, who broke with family and came to the Americas, on the wall above my desk, along with other pictures of my family. As I worked my way through the novel I often asked them to help. From the beginning I had the idea that the book needed a series of narrators, and so I imagined a group of common villagers sitting around a fire at night, each telling a story, with the first also telling the last. Together they would tell the larger story of an impoverished Sicilian family of father, mother, and seven children rising to the challenges of making the trip to the Americas. Of course nearly all of the book is fiction, with the exception of some of what I wrote about Chicago. In the book Chicago is called 'the city of greased palms'. Having been born and raised in the city, in a working-class family, I knew how the city works and I knew what you have to do if you want something done. You must grease the palm of the person who can help you. In my novel one of the sons operates several newspaper stands. This is autobiographical since my father owned a cluster of newsstands outside Chicago's busy Union Station, as well as a pair of weekend stands in downtown Chicago. I worked for him starting at the age of eight and later ran one of the Union Station stands during most of my young life. I would leave school and take the El train downtown, then a bus to Canal Street, adjacent to the Chicago River, arriving just in time to open my stand and organise the others and begin our late afternoon of work selling editions of the Chicago Daily News and the Chicago Sun-Times to the thousands of suburban office workers rushing to the Union Station to catch their commuter trains home. I also used the good sense that my Italian family taught me. I learned at an early age that there was a certain virtue in being clever, in phrasing something so that the listener, if he or she was smart, would understand. Only a dolt says something clearly, simply, directly. So, for example, in Papa Santuzzu when Luigi runs off into the hills and joins the banditi, he says that after he ran off into the hills he was transformed into a wolf. If you're smart, you understand the concept, and you take pleasure in the narrator's cleverness. I learned this as a child listening to the men of my family talk. The women had special ways of talking, too. I used these techniques in my novel. As I conceived of the book I realized I would need a new, fresh way to tell an otherwise familiar story. And so I allowed the narrators sitting around the fire to tell their stories in a sort of disguise, as if their stories were folktales or fables. By then I'd read and studied Italo Calvino's magnificent collection Italian Folktales. I noted that the tales from Italy's South often ended with rhyming couplets, so I ended each chapter with a pair of rhyming couplets. I used fable and poetry to mask—and ideally heighten the effect of—a realistic historical story. Marino: Let's move now to your latest success: The Whale Chaser. Can you tell us something more about it? How much of you is in this novel? Ardizzone: The Whale Chaser is the story of Vince Sansone, the eldest child and only son in a large Italian- American family, who comes of age in 1960s Chicago. A constant disappointment to his embittered father—a fishmonger who shows his displeasure with his fists—Vince ultimately flees from Chicago to Canada, where he ends up in Tofino, a picturesque fishing town on the rugged west coast of Vancouver Island in British Columbia. After working for a factory gutting fish and a dealer in the island's thriving marijuana trade, Vince finds his true calling as a whale guide. The novel is about displacement and abuse, both physical and sexual. One of the problems Vince must come to terms with is his family's version of la storia segreta, the unspoken story of how his grandfather, like thousands of other Italians and Italian Americans, was evacuated from prohibited zones on the West Coast and, like hundreds of others, was interned in a prison camp after the bombing of Pearl Harbor. Vince's grandfather was a fisherman in Monterey, California, and after the outbreak of World War II his boat was seized and as a result he lost his livelihood. The family was forced to moved inland, finally settling in Chicago. Vince's escape from his father's brutality and his journey to the Pacific coast completes his grandfather's attempt to settle on the West Coast prior to his forced relocation. Marino: Is there anything autobiographical in the story? Ardizzone: Yes and no. As I told you, I grew up in Chicago and am familiar with the neighbourhood and local characters that I portrayed. I also travelled several times to Tofino on Vancouver Island and did my best to represent that area and the phenomenon of whale watching accurately. My father was physically punishing, though what I experienced is not as severe as what is depicted in the book. No knife fights. One of my friends, a woman who tragically took her life several years ago, was sexually abused as a child, and I used parts of her life's story in the novel. So while sections of the novel were grounded in autobiography, I was able to develop the material into a more expanded version fueled by imagination. Regarding Vince's flight to Canada, like many young men of my generation after I finished my undergraduate degree I was at risk to be drafted and sent to Vietnam. Since I'd demonstrated against the war and been arrested twice for peaceful anti-war activities, I knew that if I was called to service I'd be arrested and imprisoned. A few years earlier the government held a lottery, and each young man born in the year I was born was given a draft number based on his birthday. My number was 141. Relatively low. I was certain I'd be called up. Let me add that for several years I petitioned the draft board for conscientious objector status, but each time I applied I was refused. Three options lay before me: Vietnam, prison, asylum in Canada. As a result I researched and plotted my escape to Canada. I used those details in the book. Fortunately I didn't have to make that choice since the miraculous happened. The last lottery number the state of Illinois called up that year was 140. I'd escaped by the width of a hair. Marino: In The Whale Chaser you also deal with a very sad episode of the history of Italian Americans: the concentration camp experience during WWII, the so-called storia segreta (secret history/story). Why did you decide to incorporate it into your novel? Ardizzone: Some years ago I heard an African-American writer say that it was the responsibility of every African-American writer to add elements of African-American history into each of their works. The idea was that people, any people, should be responsible for telling their own histories. How else can general readers learn about events in history if the very people to whom the history occurred don't make note of it, celebrate it, mourn it, bring it out from the darkness and into the light? Writing something about the internment of Italians during WWII was always in the back of my mind, something I knew I'd use someday in one of my stories. As I worked at my desk on a novel about a brutal father who takes out his anger and unhappiness at life on his son, I knew that as a responsible writer I shouldn't create characters who are one-dimensional, purely good or purely evil. I felt I needed to give him a backstory that might explain, or at least contextualise, his rage. So I put the storia segreta into the novel and tried to show how it affected three generations. The grandfather, whose fishing boat was seized and who was imprisoned and then more less driven crazy. The father, who fought bravely and valiantly in WWII, only to return to an abandoned home in Monterey, California, and realise that his father's boat was gone, and thus his livelihood was gone. And the son, who had to endure his father's bitterness and rage. One of the central themes of The Whale Chaser is dislocation. If you factor in Papa Santuzzu and Larabi's Ox, I believe dislocation is among the central themes of all of my work. Marino: Why didn't the Italians and Italian Americans speak out about the seizure of property and the internments? Ardizzone: I'm not a historian and can't really say much more than what I put into the book. Of course you know that the overwhelming majority of Italians who came to the Americans were from the Mezzogiorno, Southern Italy, and were highly suspicious and distrustful of authority and government. In addition, speaking Italian was suppressed. The government posted signs in post offices and other public places that said, 'Don’t Speak the Enemy’s Language!' Below the command were racist caricatures of Hirohito, Hitler, and Mussolini. As a result many Italians stopped speaking their native language in public, and many changed their names and denied their actual nationality. They attempted to blend in, to become 'white' and embrace 'white' values. So I'll suggest that both omerta and shame were contributing factors. Consider that Sacco and Vanzetti were put to death less than twenty years earlier, in 1927, and Italian Americans were already suspect, linked with criminality throughout the media. Depictions of Italians in the media continually associated them with anarchy and crime. Finally, this is a question for those with expertise in history and sociology. I'm simply a fiction writer, a story teller. Marino: Why have Italian American writers so seldom touched on the subject of the internments? 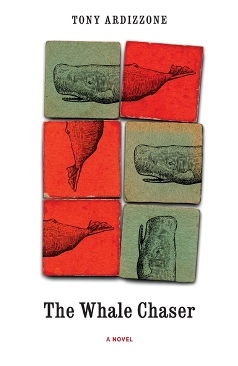 Ardizzone: To the best of my knowledge, The Whale Chaser is the only novel to make use of the relocation and internment experience of Italians and Italian Americans. It's the only novel that portrays the story of the seizure of the Italian fishing fleet on the Pacific coast. As for the larger question, we might as well ask what subject matters the North American reading public embrace. Every Italian American writer has been told—countless times—by agents and editors that there is no readership for Italian-American books. They're told that Italian Americans don't have a history of buying books. All Italian-American writers know that after Mario Puzo's lovely first novel, The Fortunate Pilgrim, failed to sell, even though it was a critical success, Puzo turned to a much more marketable subject matter. You know how many copies The Godfather sold. The Italian American writers who have written best sellers, who publish widely and with considerable support from their publishers, often don't work with subjects that are necessarily Italian. Consider the works of Don DeLillo and Tom Perrotta, two excellent writers whose books sell thousands of copies. Even film makers like Frank Capra Americanise their work. Note that the characters in It's a Wonderful Life aren't identified as Italian. Of course the film was released only two years after the end World War II, when the government forced over 600,000 Italians to carry 'resident alien' registration cards, and when hundreds were imprisoned and interned. If you watch It's a Wonderful Life carefully you can see that the Baileys embody Italian-American values. When the greedy banker, Henry Potter, denies George the money needed to keep the Savings and Loan running he chides George and calls him 'a nursemaid to a bunch of garlic eaters'. Don't misread the movie. George Bailey is Italian, as is his family. All they lack are Italian names. Marino: What do you recommend to young writers? Do you adopt any special techniques while writing? Ardizzone: The answer to this question is easy. Read. I would offer the same advice William Faulkner gave to writers: 'Read, read, read. Read everything--trash, classics, good and bad, and see how they do it. Just like a carpenter who works as an apprentice and studies the master. Read!’ The simple truth is that a writer is hardly better than what he or she has read. Marino: What is your relationship with Italy, the land of your ancestors? Ardizzone: I've travelled to Italy several times, most recently this last May  as part of an international conference about the Italian American experience. Of course I would like to travel in Italy much more extensively. I’m very pleased that some of Italy's finest scholars are taking an interest in fiction and poetry written by Americans of Italian descent, and I've been fortunate to have had my work translated and published in Italy. I know that my Sicilian grandparents would be extremely proud. Neither were educated. Neither could read or write. They spent their entire lives working, doing what they could to make life better for their children. In the Garden of Papa Santuzzu is dedicated to them, along with everyone else who made the passage from Italy to the Americas. Marino: Any anticipation on your future literary plans? Ardizzone: I continue to work on a book that's currently titled By the Fountain of the Four Rivers. 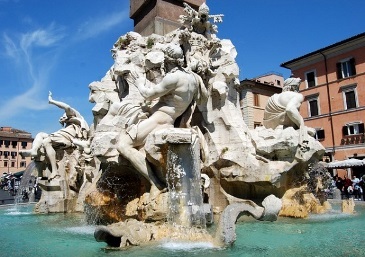 The book is set entirely in Rome. Its central characters are both North American and European, both travelers and natives. The historical narratives of various churches and works of art are echoed in the contemporary lives of these characters, who gather at book's end in Saint Peter's Square on the evening that Pope John Paul II dies. As for future plans, I take my own advice and read widely. I also stay in touch with a community of writers which includes hundreds of former students, many of whom have launched successful writing and teaching careers. I'm also beginning work on a new book set, as you might guess, in Chicago.